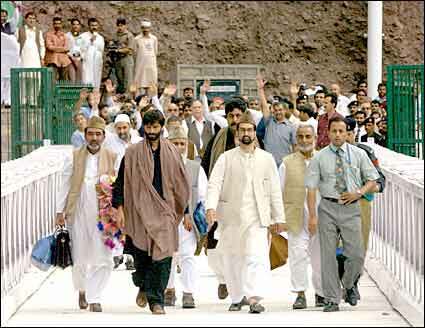 Kashmiri separatist leaders -- Jammu and Kashmir Liberation Front chief Yaseen Malik (in black) and All Parties Hurriyat Conference chief Mirwaiz Umar Farooq (on Malik's left) -- are joined by others as they cross the Kaman Bridge on the Line of Control on Thursday. The leaders returned after a fortnight-long visit to Pakistan and Pakistan-occupied-Kashmir. A reception organised by APHC supporters in their honour was cancelled in view of the June 13 car bomb in Pulwama that killed 15 and left 100 injured. APHC leaders believe that their Pakistan visit has established the Kashmiris' right to be consulted by both India and Pakistan on any decision on Kashmir's future. Talking to reporters at Kaman Bridge, Malik said he was happy with what their visit has achieved. "We exchanged ideas with leaders from Pakistan-occupied Kashmir and also the Pakistan government," he said.